The New Cotton Mouth Kings CD! So You wanna dance fast? Well, I thought I'd post one more time for 2010...I'd actually like to talk about a few dance things, like our Monday nights which are doing great. Meschiya Lake had the idea one night, as we were drinking at Mimi's and we made the proposal....what i didn't know was Mimi's loves dancing, so anyways, Every monday night we have our free dance class at 9:30 which is about 30 minutes. "Mimi's in the Marginy" as it's called, is just a short bike ride from the French Quarter, straight down Royal street, until you hit Franklin, the perfect distance not to be a tourist trap, yet close and easy enough to get to that you voice directions to anyone, and walk it. 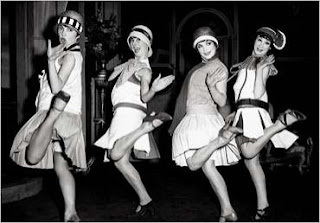 Unlike other "drop in" classes, we normally teach a different dance every week, something like Shag, Charleston, Two Step maybe Swing, basically just historical dances that are easy to do socially. Allow everyone to find themselves through dances and steps, instead of just teaching people one thing. We certainly don't dance to one rhythm like other places, so it's important to have the tools to dance to all rhythms as well. Meschiya Lake and the Little Big Horns are the house band on Mondays, which allows for the perfect atmosphere, at Mimi's. The Bar flows, the lights down dim, smoke fills the air as Meschiya's delivers song after song. Behind her we can always count on Jason Jurzak on Bass to give the dancers their needed "slap,boom,slap,boom". Mondays are great, cause it's more locals, and people have a different kind of fun. Another fun thing, that has started is Meschiya Lake, Laura Manning and Mia Goldsmiths monthly Variety Show and Dance at One eyed Jacks. Again, with the Little Big Horns playing live, we have all kinds of great acts put together in a show that is simply awesome. I could go on and on, about the Holiday show they just did, but having the band dressed in their Santa outfits in the Balcony playing Christmas songs like the Salvation army will be hard enough to beat next month, not to mention the 3 girls singing Alvin and Chipmunks songs! Meschiya brings us back to her circus days, with some of her old fire acts, which are crazy! Dante the magician, Trixie Minx, Ally Ooops, Nola Jitterbugs....The whole evening is simply awesome, they actually have Taxi dancers for leaders and followers. If your going to visit New Orleans, do it on the weekend were you can catch this show at One Eyed Jacks! It's been a long month, German, Spain, Solvenia and Lithuania, tonight being my last big night in Vilnus but i have classes tomorrow and will probably celebrate one last night, although it will be chill. I've meet some extremely amazing people this month that have been nothing but kind, who shared their homes, food, family and friends making my job so much more rewarding for without them it certainly would be a much more difficult task. 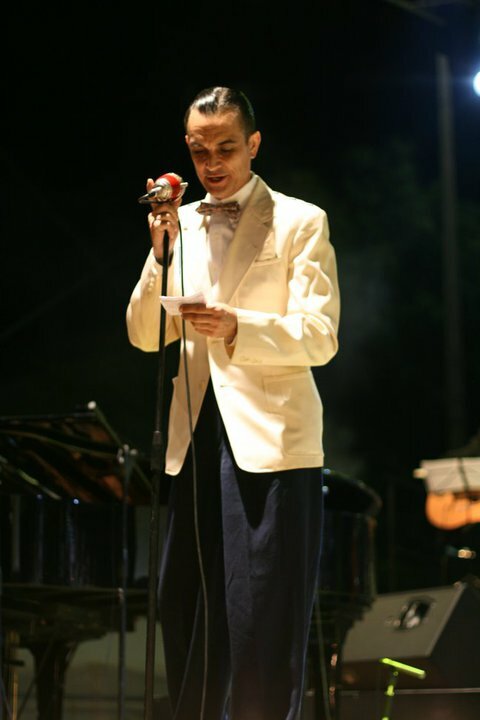 Aside from teaching i did 3 lectures, Spain being difficult for the obvious reasons with the language barrier, however it was very well received being it was during the Terressa Jazz Festival. Slovenia is always a blast, being my 3rd time there, the people are layed back and seriously know how to party, having been there before it's always easier to lecture and to speak my mind on issues that perhaps i would not go into as much deep if it was a more academic or professional crowd. That night, our band was able to play for the ballroom, being that they brought in the other members for the weekend, amazing week for sure. Aside from the horse burgers my special favorite is the Green Rabbit Absinthe bar, the owner was nice enough to give me a Bottle and exclaim "New Orleans is the home for Absinthe!". This is my first time in Vilnus, Lithuania and all i can say is wow! the first night i got to see one of the local bands on home turf, some of which I've know for a few years, called the Rhythm Junkies. They were amazing, a touch a Gypsy and dixie mixed together with powerful and amazing vocals by Milda, Jazz is no doubt alive here. 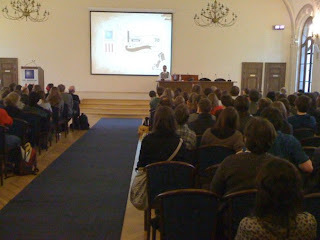 My lecture here was a big larger a good crowd of over 200 packed the room, which was sponsored by the American Embassy. Their representative was a really great guy who was from Kansas city and made things extremely comfortable, in this very professional setting. Last night they brought in the Carling Family band from Sweden, which are one of the best bands you can hear anywhere in the world. They are playing again tonight later on after we get to hear the Lithuanian Military band, which I've been told will have 40 pieces. This i can't wait for, i can only image the power they are going to throw at the dance floor. It's been a long journey and i look forward to heading back home to New Orleans, with lectures and demo's and performances to be done at French Quarter Festival next weekend, and the New Orleans Jazz Festival the weekend after. anyways, I have many articles started which i will finish upon my arrive back to the states, so stay tuned. and hope to see you in NOLA or on the road! How lucky I am! Just after the recent amazing release of the new Cotton Mouth Kings, another awesome CD comes out by one of the newer local New Orleans Bands. The Tuba Skinny Band is one of bands that loves busking on Royal street, and seeing them will leave you speechless! Vocalist Erika Lewis fronts the band with Todd, or "Tuba Skinny" handling some of the musical direction, yes, from his Tuba. The band is no doubt a team, a team of friends who create not only a music of a by gone era, but also a very individual sound. 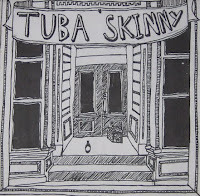 The new self titled CD, TUBA SKINNY, is an amazing mix of tempo's all well rooted in early blues and jazz. Handling the strings is Alynda on Banjo and Kiowa playing the Guitar and vocals, with the horns handled by Barnabus ,Trombone and Shaye on Cornet. Lastly, we have Robin on washboard, who's dynamic playing inner weaves with the band which should no doubt cause you to start stomping your foot! As i mentioned above, you can find this group playing on Royal street in the French Quarter and you can expect some great dancers performing with them as well. when they hit the street. At night the band attracts the best dancers in town and from around the world when visiting New Orleans. This CD Captures this amazing energy perfectly, and I'm sure that there will be more then a few tracks being played at dances, and by teachers around the world. One last tid bit before I leave you to run off and GET THIS CD. In this mix of 13 tracks, There is an original written by Erika, However, I'm not going to tell you which one it is…it fits in in between the classics so well I know you'll be blown away! The self titled CD "the New Orleans Cotton Mouth Kings" has been a couple weeks now, and for many reason's I continue listening to it, if not for pure pleasure, then to take notes on the concept of this amazing band. The style of music alone is something to ponder, taste, digest and yes, relish in the after taste. 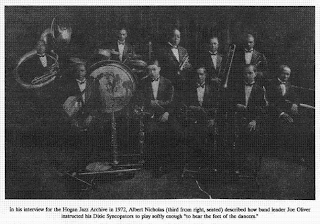 I've heard the members claim the style as being "New Orleans Swing", a description which I have thought a lot about, and drawing the only possibly conclusion...I couldn't agree more! Before I get into the CD, Let me share just a tad of history. This band goes back about 10 years and was originally called the "New Orleans Jazz Vipers". Last summer the band reformed under it's new name 'New Orleans Cotton Mouth Kings'. On Guitar we have John Rodli, known to many as the voice behind the "Blue Drag" on the Vipers recording. John's Vocal fans will be pleased to hear him once again on "I wished Upon a Moon" and "Pennies from Heaven". No doubt one of my favorites from this band for awhile now is their rendition of "Nagasaki". A song that features Matt Rhody, who not only swings the group with his vocals but also sends the room on his Violin solos. Thanks for including this track fella's! The big surprise for me on this CD was the Harlem Hamfats song "Delta Bound" , sung by Tom Saunders, a Jazz 78 collector who plays the Bass Saxophone. This version is a bit faster giving it a new fresh feeling that certainly will bring a smile to anyone who likes a new twist on old things. Charlie Fardella's Vocal's on songs like "Corrina Corrina" is a great example, the band takes a new sound with the band backing the vocals with Matt's Violin leading the way before Charlie finally punches through with his Trumpet. On another vocal, Bruce Brackman singing their "Gospel Medly" which is actually 3 New Orleans standards, combined perfectly, the band is obviously having fun recording these as you can hear on this track. Bruce's Clarinet playing is most powerful and exciting sound I've ever witnessed, Charlie packs more then just a punch with his trumpet, I only wish everyone could stand in front of them at DBA or the Cat on one of their regular gigs and witness this group of players who truly enjoy playing first and foremost. 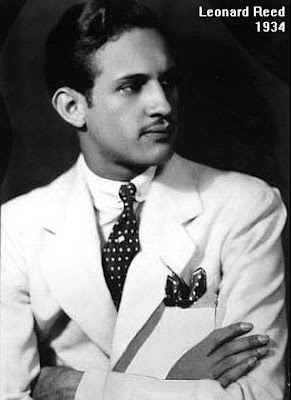 None of this could not happen without bass man Robert Snow, perhaps best described as a swinging time machine….if your dancer, he is the one that is driving your feet. The groove Robert lays down is infectious and from there the layers of each instruments fit like a puzzle propelling the rhythm in amazing time. Aside from being difficult responding to multiple users named anonymous, if i'm to take the time to share or respond to someone. i'd at least like to know the person is real, or at least has real intentions. so I'm laying down some type of comment security, logging in, or something....thanks to everyone that reads! at Tulane University which I've linked at the bottom. on the history of dance. local scene -feet first-, as a dance music. action and feeding on the energy. experiment in order to achieve it. intention was to provide a 'state of the art"
the dancers and not of the dance..
awkward moments: "Our debut was pitiful. South dance, Come on and try "Have fun". living rooms before venturing out in public. were comparatively more versatile and accessible. came to be known as "the businessman's bounce." attendence, record sales, seemed to prove it. particular about music on the excursion boats. trots and 90 for one steps) somebody got hell. while the other half danced with college girls. 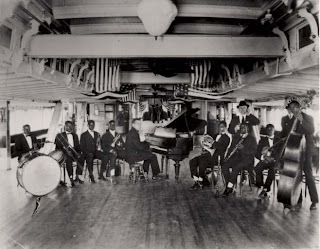 Celestin's Original Tuxedo Jazz Orchestra. assembled jazz intelligentsia just sat and listened. 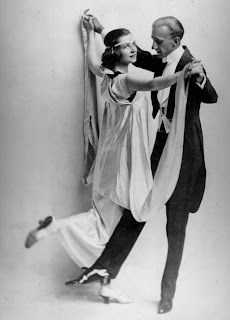 One question that always comes up when teaching, is how to dance fast. Dancing fast was never an issue, or a problem for me, because the simple fact is I dance for fun, first and foremost. In my early days of dancing as a "beginner" , i got up from my chair when the music moved me to do so, regardless of tempo. We never thought in terms of tempo, we just stepped on the floor with our Partner and "went for it" and had so much fun, night after night. I know we were not good in the eyes of a dance critic, however we had no "problem" having fun. With that all said, my generation of dancers got good dancing fast by doing it over and over, night after night socially. 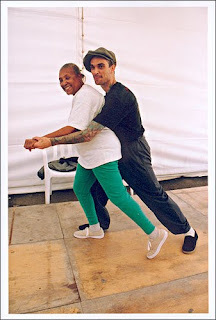 practicing for speed was something we would have never really thought about, and it wasn't until many years later, teaching a class with Sugar Sullivan who mind you was around 76. Sugar is a Savoy Ballroom Dancer and winner of the Harvest Moon Ball in Madison Square Garden in 1955, and in class we were dancing at very fast tempo's, such as Chick Webb's Harlem Congo. We were teaching a Lindy Hop routine, when one of the students asked to slow it down because she couldn't get the steps. Sugar immediately told her No! That's not how to learn to dance fast, and went on to explain that back in the Savoy Ballroom you never "slowed it down" to practice. In some cases she would have the front of the class sitting so the back could see as well, but then it was everyone to their feet, and she count everyone in. It didn't take long before the class was getting the entire routine, and those few students that were having problems she would move forward next her, to make sure they got it as well. We had fun, and at the end of the week we even took our students and invaded another class for a on the spot Battle...Keep in mind this was the first time Sugar had ever taught at the Herrang Dance Camp in Sweden which, which is the largest camp in the world of it's kind. It became common to hear Sugar exclaim "I've haven't done this since...."
Getting back to our students, we eventually discovered was that in many cases it's not a matter of the student learning a piece of choreography, it's the fact they can't dance and move fast enough. One of the great aspects of having routines besides the fact they are something wonderful to improvise on is that they are something you can do to show off your fast dancing. However you want to look at it, when you break into a routine at sizzlin' tempo's it's your muscles you want to explode and take over, allowing your mind to break away and free it's. The last thing you want to do, is trying to remember steps, with your legs failing to keep up with your thoughts. In Sugars world, it's the opposite, the legs are fast, they think ahead of the mind in rhythm with the music and having already stepped, and kicked before you even thought of stepping or kicking. Which reminds me of the first time we really danced together. It was in London, and we had been invited, among other teachers as well to teach at a Dance Festival, I remember Chazz Young being another teacher as well as Vicki Diaz, another Savoy Ballroom legend. One night all the teachers ended up going along with a crowd to the historic 101 club. I don't recall the band but at some point I asked Sugar to dance and it was a slow number, by that I mean uncomfortable to Swing out and start Lindy Hopping. So I kept it simple and rocked in rhythm until the song ended and asked to do another, which she accepted. When the band kicked back up it was a fast one and immediately a jam session broke out with the dancers making a circle, and one couple entered at a time trying to show off and one up each other in a friendly competition. Sugar in the front of that wall of of people in the circle, with a glowing smile on her face turns over her shoulder to me and says "lets show them how to do it.!!" Mind you, I had never danced with her until that previous slow blues, and was terrified that she wanted to Swing out and basically Show Off! At this point of my life i was in fact dancing all the time with ladies well in their 80's in Los Angeles, many of which were legends who i could dance very fast with. However, in Los Angeles we did a dance called the Balboa, which is a very conservative shuffling step in place. The smoother and more conservative the better a Balboa dancer you are, these older masters would always compliment when done right, and correct when done wrong. Here for the first time in my life, I had a legend asking me to dance Big....and fast! well, to make a long story short we did what we did, and unlike anyone I've dance with, Sugar was killing every step, and each time we whipped out in open, she would kick out a different variation of improvised steps. Then at the end of a phrase she kept her feet planted and swiveled her knees and and hips, hard from side to side with a swivel motion and the room went crazy. Sugar was showing us, how she did it, a Savoy Ballroom veteran that was among a group of Lindy Hoppers who localized the Ballroom, and would represent the Ballroom when competing at such major events as the Harvest Moon Ball, which pitted Ballrooms around New York. 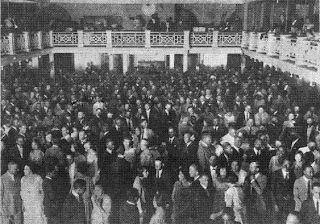 Ballroom's such as Roseland, and Glen Island Casino would sent their top 5 finalist to the Harvest Moon Ball, and Savoy Ballroom was no different, however taking pride as Home to the Lindy Hop. Sugar first entered the Harvest Moon Ball representing Roseland Ballroom. She exclaimed she missed the deadline to the Savoy Ballroom's preliminary contest, so headed downtown to Roseland and was able to Win. She explain at Madison Square Garden the Ballroom teams would first meet with the bandleader to go over the music. Sugar didn't remember specially what song it was the Roseland dancers used, other then a standard popular dance number, but the next thing she remembers changed her life, she remembers watching the Savoy Ballroom Lindy Hoppers hitting the floor dancing twice as fast as the other Ballrooms, throwing airsteps and dancing in and out of routines bringing the Garden to heightened applause. She told me it was that moment she knew were she needed to be dancing, practicing and spending her time. So from her house, near 125th and 7th ave, she would head to the Savoy and it was not long before she was representing the Savoy Ballroom. The day came in 1955 when she finally won the Harvest Moon Ball with her Husband George Sullivan. One time I asked Sugar, what does Savoy Style Lindy Hop mean to you? she thought for a second and said, "Speed, what makes Savoy dancers different is they can dance so much faster then any other dancers. It natural, it is what we worked on to be the best...and we had the bands to do it!" Then she did probably single best exercise I've ever seen. She had everyone stand up, she motioned for me to put on a fast song, I can't remember what song it was but it was pretty fast like "Clap Hands here comes Charlie", she told every to get up on their toes and run in place to tempo. Once everyone seemed to be doing this, the class looked around at each other in approval, but then Sugar said, ok good that's your time, now lift your KNEES!!! She exclaimed this is easy to keep time, with little steps on your toes, but now she made everyone put their hands out front palms face down about waist high, and made them lift their knees and hit the hand, meaning high enough that your thigh is parallel to the floor. I tried it, and found it very difficult...although, i could dance these tempos this exercise helped a lot, not only in building the proper muscles but also being aware of consistency and control in movement. Lindy Hop as done by the best performers was in fact most incredible to see how extended the body can get and yet, still contract fast and get your feet back under you quick enough to stay on tempo. Yes, it's a workout...that's what dancing fast is, especially if your trying to Lindy Hop or Shag. So I recommend making a CD to practice dancing too, with Fast music and dance to it every day by yourself for 10 to 20 minutes. As one old timers used to tell me, "if you can't dance it alone, what on earth makes you think you can do it with someone else.."
Sorry, it's been awhile since i blogged but so much has been going on it's a bit hectic. I'm finally all moved in, and for the most part adjusted. I will say it's a dream to be able to finally make a living playing music and dancing. After Jelly Roll Morton's birth it's possibly he went to live with his father for a few years on Gravier st. 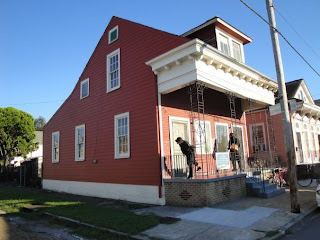 But around 1895 he went to live with his Mom and Step father at this house on Frenchmen st. It was at this house around 1900 that Jelly Roll started using his step dads Name "Morton". and about 1904 when Jelly Roll left New Orleans to Travel around the United States. Living playing music and dancing among the New Orleans jazz clubs is a wonderful life, there is no other place like it on earth, and being able to share some dance history here is a great feeling. Because it's New Orleans it doesn't take much to get people dancing, in their blood here like no other place i've been. Unfortunately, I haven't really been out to "Lindy social dances" which take in the Mid city (I've been corrected, they are also in Surrounding neighborhoods and since this was written another has started at the WW2 museum ). I have continued to work traveling to festivals while at the same time moving to New Orleans. That's a tricky one to say the least, None the less this past season i was in France,Slovenia,Hungary and North Carolina. In Hungary i sat in on washboard with with Tamás Bényei Hot Jazz Band, in France I saw Dan Levenson from New York who has always been one of my favorite Clarinet players since the Rhythm Rascals recordings, and in Carolina over new years i played with the Loose Marbles who are from New Orleans and have been helping to lead back "old style" New Orleans jazz. Slovenia was more a vacation, aside from doing one workshop and some privates, it was hanging out with Katja and friends eating great food and sitting in a Absenthe bar called the Green Rabbit. The Spring time is going to bring many more stories from here and abroad with Mardi Gras season starting up and a European tour on the Horizon. Also, I have many articles on the shelf to share once i find the pics to go along with them!